Several species of white grubs are found in the Midwest. Proper identification to species is important since differences in life cycles and feeding habits have been observed among these grub species. Some grubs rarely if ever feed on soybean, while others may do so for parts of one or more seasons. 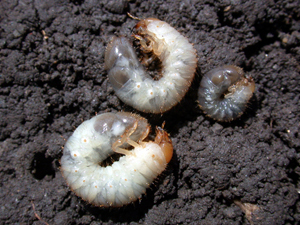 White grubs are the immature forms of scarab beetles, the well-known May/June beetles, masked chafer, and Japanese beetle. These grubs, 1/4 to over 1 inch (6 to 25 mm) long, are white with brown heads and have six prominent legs. Their bodies typically are curved into a "C"-shape. White grubs are occasional pests of soybean seedlings. Soybean fields with white grub injury were usually in sod or some other cover crop (May/June beetles, masked chafer, or Japanese beetle), in set-aside (May/June beetles, masked chafer, or Japanese beetle) or in soybean (Japanese beetle) the previous season. May/June beetles and the masked chafer prefer to lay their eggs in grasses. The Japanese beetle will lay its eggs in grasses, soybean, and, to a lesser degree, corn. 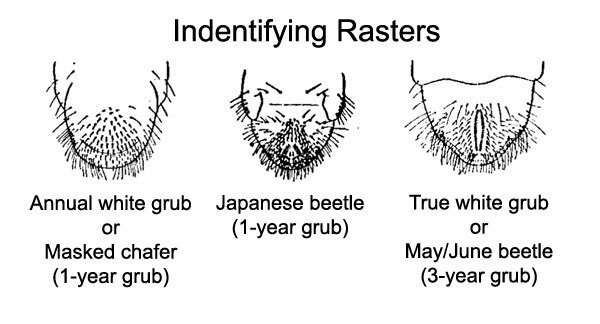 May/June beetles have a two to three-year grub cycle (grub stage from August through the next year and sometimes during part of third year), while masked chafer and Japanese beetle have a one-year life cycle (grub stage from late July through mid June the following year). 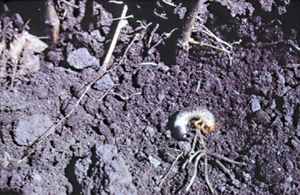 White grub damage typically appears as gaps in rows where plants fail to emerge and/or as wilted, discolored, or dead seedlings. If such damage is apparent, dig up some soybean plants in the affected area(s). Look for white grubs in the root zone and examine the root system for pruning. Japanese beetle grubs are not known to cause economic damage to soybean. However, they may be present in a soybean field during the early season where they feed on other plants and plant residue. Before planting. If soybean is to be planted into a high risk field, such as sod or set-aside, soil samples should be taken and examined for white grubs before planting. In 5 randomly selected areas, dig up a 2 feet long by 1 foot wide by 6 inches deep (60 x 30 x 15 cm), 1 cubic foot (0.03 m3), sample of soil. Place the soil on a piece of black plastic or cloth and carefully search through the soil, counting the number of white grubs found. Determine the species of grub and number per cubic foot. After planting. Where damage is found following plant emergence, look for grubs and damaged plants in 5 randomly selected areas. Dig up a 2 feet long by 1 foot wide by 6 inches deep (60 x 30 x 15 cm), 1 cubic foot, area centered over and down the row. Place the soil and plant samples on black plastic or cloth determining the species of grub and number per cubic foot, and evidence of root pruning. Also, estimate the plant stand that remains in the field. Use the following drawings of raster patterns, and a magnifying lens, to determine the species of white grub(s). If needed, contact your local extension service for assistance with identification. Before planting. Two or more live May/June beetle grubs per cubic foot of soil prior to planting may signal a potential problem. No planting-time insecticides registered for soybean have white grubs on the label. 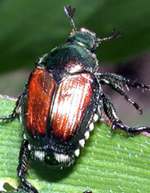 Therefore, if high numbers of May/June beetle or masked chafer grubs are noted in fields to be planted to soybean, plant corn or some other crop that has insecticides with white grubs on the label. If only Japanese beetle grubs are found, it should be safe to plant soybean as long as it is not extremely early (however, continue to watch infested fields). White grub problems are most likely in fields previously in hay or pasture, or fields which had a late season weed problem or cover crop the previous year. Such fields should be closely watched during tillage operations for the presence of grubs. After planting. There are no rescue treatments available for white grubs in soybean. The decision to replant should be based on the remaining healthy plant population, the date, yield expectations, etc. Where planting in wide rows, it may be feasible to replant down the middle of the rows without destroying the healthy plants in the original planting. The result would be the equivalent to narrow row soybean. The following table may help in making replanting decisions. If control is necessary, contact your state Cooperative Extension Service or click here for control materials and rates. © 2009 Purdue University. All rights reserved. Purdue University is an equal access/equal opportunity university.